SaleMaker is an advertising-supported browser add-on which is aimed at enhancing your shopping experience. The program monitors your actions while you are browsing shopping websites and displays various offers, some of which may have nothing to do with your actual interest or search terms. The SaleMaker browser add-on is compatible with Internet Explorer, Google Chrome, and Mozilla Firefox and is promoted at salemaker.info. However, the website does not have a download button, which signifies that the program is spread over the Internet by some other websites and computer programs, or rather by software installers. We recommend that you remove SaleMaker, because this program displays third-party advertisements which are not endorsed by SaleMaker. SaleMaker is not a new discovery to malware researchers, because it is based on the JustPlugIt browser add-on creation engine, which is well-known to our researchers. 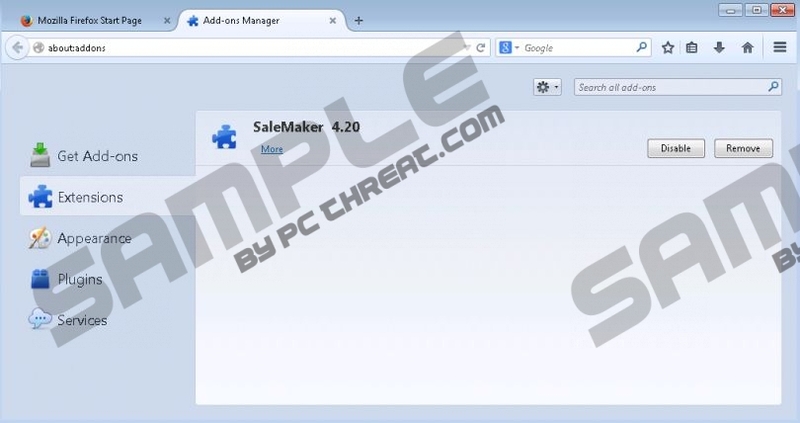 Programs built using this engine are known to be capable of altering their names, and, in the case of SaleMaker, you may encounter variations such as saalesmakerss, SaAleMsakeer, and many others. Due to the fact that the JustPlugIt platform is very popular among software developers, it is not surprising that there are many similar programs, including RightCoupon, RealDeal, TicTacCoupon, LuckyCoupon, etc. All these programs fall into the category of adware, and we encourage you to remove such programs from the PC so that you do not have to experience any privacy-related issues. As mentioned above, SaleMaker does not endorse the third parties advertised, which means that SaleMaker may be used to advertise any unreliable website. In addition to shopping-related pop-ups and coupons, SaleMaker may show you some suspect advertisements promoting updates for your software, online quizzes and contests, games, and other questionable products and services. Hence, we suggest that you take action right now to remove SaleMaker from your computer. You should also bear in mind that the adware program may be monitoring you. Almost all advertising-supported browser add-ons collect certain non-personally identifiable information for marketing and advertising purposes, but, in some cases, some personally identifiable information could also be collected. It is possible to uninstall SaleMaker, because the program has its own uninstaller; however, it is highly advisable to rely on a reputable security program, because the operating system could be affected by some other unreliable programs. We recommend using SpyHunter, because this program successfully deals with JustPlugIt-based browser add-ons and many other threats, such Trojan horses, browser hijackers, adware programs, ransomware infections, and many other malware and spyware threats. In case you have any questions concerning the removal of SaleMaker, feel free to leave a comment below. In order to make sure that all the components of the program are removed, you should implement a reputable scanner. Click the button below to download our recommended scanner and invest in the program if need be. Quick & tested solution for SaleMaker removal.